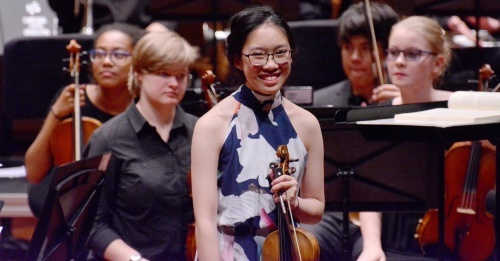 The final “Icons” concert by the Canberra Youth Orchestra (CYO) focused on Brahms and his Symphony No. 1. The program also included works by Chaminade, Sibelius and Mendelssohn. Conducted by Leonard Weiss with soloists from the CYO, Lily Bryant and Donica Tran, it was an evening of fine music well played by all concerned. It commenced with a charming work by Cecile Chaminade, her Flute Concertino in D major, Op. 107. Chaminade was one of the few prominent and respected female composers of her time. On flute, CYO Soloist, Lily Bryant performed the work expertly and with great feeling. It was nice to see her appearing so relaxed while playing that she was able to share a smile with the conductor as the work progressed. Next, the orchestra played “Finlandia” by Jean Sibelius in an arrangement by Steven Verheist for the Brass of the Royal Concertgebouw Orchestra. This dramatic work is given even more strength in this arrangement and the brass members of the orchestra gave a spectacularly clear performance. Mendelssohn’s Violin Concerto in E minor, Op. 64 is a very well-known work which is always a delight to hear with its lyrical melodies and dramatic contrasts. Solo violinist, Donica Tran, gave a strong performance, technically well-played, if a little quiet against the orchestra at the beginning. The final presentation, Brahm’s Symphony No. 1 in C minor, Op. 68, was heralded as “Beethoven’s 10th” when first heard and the influence of Beethoven is clear in the music. The orchestra played it very well, especially the quiet second movement which is a nice contrast to the bold first movement. To end, the joyful finale had an excitement in its emotional playing that was very satisfying.